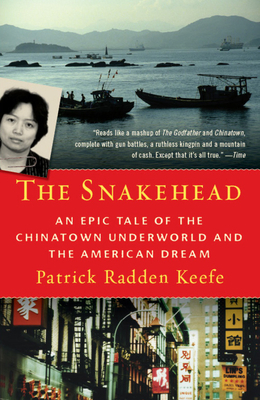 In this thrilling panorama of real-life events, Patrick Radden Keefe investigates a secret world run by a surprising criminal: a charismatic middle-aged grandmother, who from a tiny noodle shop in New York’s Chinatown managed a multi-million dollar business smuggling people. Keefe reveals the inner workings of Sister Ping’s complex empire and recounts the decade-long FBI investigation that eventually brought her down. He follows an often incompetent and sometimes corrupt INS as it pursues desperate immigrants risking everything to come to America, and along the way, he paints a stunning portrait of a generation of illegal immigrants and the intricate underground economy that sustains and exploits them. Grand in scope yet propulsive in narrative force, The Snakehead is both a kaleidoscopic crime story and a brilliant exploration of the ironies of immigration in America. Patrick Radden Keefe is a fellow at The Century Foundation and the author of Chatter: Dispatches from the Secret World of Global Eavesdropping. A graduate of Columbia University and Yale Law School, and the recipient of a Marshall Scholarship and a Guggenheim Fellowship, he is a regular contributor to The New Yorker, Slate, and many other publications. The Snakehead was a finalist for the J. Anthony Lukas Prize, awarded by the Journalism School at Columbia University for excellence in American nonfiction writing. For character dossiers, an image gallery, interactive maps, and more, please visit: www.thesnakehead.com.